Winter is approaching quickly, and the forecast for the 2014 – 2015 season looks to be nearly as exciting as the last. With more snow days on the calendar, it’s time to start thinking about how to take advantage of the winter’s colossal snow falls. A trip to the Deep Creek Lake area in the mountains of Western Maryland is worth the drive. Just three hours from Washington, DC, and five and a half from New York City, it’s an easy weekend trip to check out Maryland Ski Resorts near Lake Pointe Inn, where you can find winter activities for the whole family. 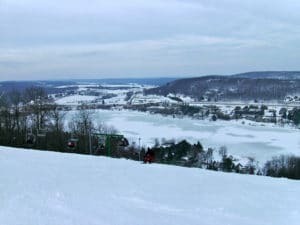 Wisp Resort is Maryland’s premier ski and snowboard mountain, and is located right across the street from Lake Pointe Inn, on the shores of Deep Creek Lake. Wisp has 172 acres of downhill terrain, the majority of which are beginner slopes. Sign up for ski or snowboard lessons or hit the cross country ski trails in the back country. The snow tubing park is another big hit for the adventurous ones in the family. Wisp Resort is open from 9 am to 9 pm, so the family can ski for all or part of the day before heading back to Lake Pointe Inn to sit by the fire and sip hot chocolate. For real winter sport enthusiasts, there are numerous ski resorts near Lake Pointe Inn. Just a three hour drive across the border in West Virginia, deep in the Monongahela National Forest, you’ll find Snowshoe Mountain. Opening on November 26th for the season, Snowshoe offers similar winter adventures in a much different yet equally beautiful setting. Snowshoe is well known for their epic snowmobile tours through the forest’s back country, which is an exciting way to see this beautiful terrain. An hour north of Lake Pointe Inn you’ll find Seven Springs Mountain Resort tucked between state forests and parks. Seven Springs offers more varied terrain, and seven progressive terrain parks. Seven Springs has the East Coast’s only olympic size half pipe, and the rail park has over 100 features. The mountain offers terrain specific coaching for those wanting trick training. Double the fun by purchasing a Highlands Ticket, which gives you access to both Seven Springs and nearby Hidden Valley Resorts. Other highly recommended and scenic Maryland area ski resorts are Blue Knob Resort, Canaan Valley Resort, and Liberty Mountain Resort. Winter sports families will find plenty of adventure around the Lake Pointe Inn. A day off the slopes will give you a chance for ice skating, and hot tubbing. Whether you stay indoors at the Lake Pointe Inn or are in the fresh air you’ll be able to enjoy the breathtaking views of this mountainous region. Book your weekend trip to Lake Pointe Inn soon and you’ll still be able to catch the pre season ski pass sales. If you’re booking for the holidays booking ahead is a great way to save money. The winter Lake Pointe Inn experience will leave you wanting to come back for the other seasons. The area offers year round outdoor activities, and a peaceful environment to relax indoors.